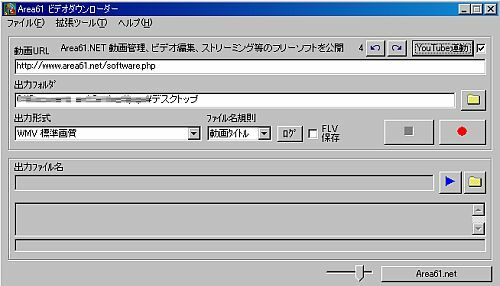 The free software that can be preserved by downloading the animation of YouTube is said, "The Area61 video down loader". "The Area61 video down loader" downloads the animation published in YouTube, and is very popular in the convenient, free software that my personal computer can preserve by various formats such as FLV, WMV, MPG, and AVI now. It wants to register this animation to ipod etc. easily, and there is a convenient, free software that is downloaded and preserved and to introduce it though various, interesting animations are up-loaded in YouTube. The YouTube site, and it cooperation operates and it is possible to do with the download ranking site the preservation file name downloaded from YouTube the accessory it as for the title and ID. It corresponds to the download of animation for which the attestation is necessary. the synchronization function with iTunes. Animation URL specification can download the animation reproducing with IE (Internet Explorer) at once by handling another and the YouTube synchronization function that can be done by the drag & drop of cut & paste and the link. referred to when synchronizing it. The file that does the download preservation from YouTube is retrieved and drug & can drop in animation URL column, and the animation of YouTube related to the file name be retrieved. It is also possible to retrieve the title of ID. I will see the screen actually started. Preservation is begun with a red button. Are it also interesting to preserve a pop promo and a live image etc. of a favorite musician, and to look for the material such as MC? Anyway, let's enjoy preserving anxious animation and image. In addition, the downloaded animation can be reproduced at once when the video browser synchronization function is used, and the still picture capture etc. be done. The FLV animation can be seen directly in a video browser, and it know the method of editing the video with the video mixer with http://www.area61.net/flvsplitter.html. The operating manual is in homepage .... http://www.area61.net of Area61.NET. Copyright ©　2003-2010 potman All rights reserved.